this card from 2007 first caught my eye for today's flashback because of the red, white, and blue. but then when i followed the "you might also like" link to it under one of my posts earlier this week, it seemed especially perfect because i really need to take time to just "stamp the day away" like i did back then. especially with the kids gone. 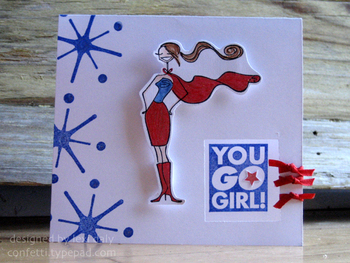 plus, i really like all the bella stamps i used that day, especially superbella above! so i added a row of pink primas, with jewels in the centers, to match the punched flower on the beachabella's bag. 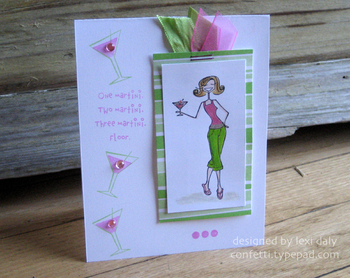 and then the card worked for two more challenges--floral, feminine, & flirty and all that glitters--bonus! i think they're both pretty. the first is my usual cas/clean and simple. the flowers add a little more punch to the second. but i'm really not sure which version i like better. do you have a preference? give thanks & hook 'em! one of our members led a project turning clear card boxes into mini file boxes or treat bags. i thought this would make a great little file of scrapped cards with things to be thankful for, including pictures from thanksgiving, or maybe a container to store place cards, or even packaging for thanksgiving treats to give a teacher. so cute and lots of possibilities--thanks kim! while i was at the meeting, the tx/ou game was in full swing--and i was checking the score from time to time on my iphone. love that thing! anyway, i was very excited when texas won, and of course had to stamp a card in their honor. my fellow longhorn stamper geeta sent me these awesome stamps last year from deadbeat designs. don't they go well with pompomabella for this occasion?! and just in case you didn't know, su! pumpkin pie is the perfect burnt orange! yeah tigers--bcs national champions!!! 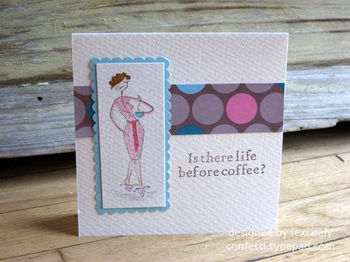 and yeah for me--i had time to make a quick card! of course, my computer decided to start shutting down on me again as soon as i downloaded pics from my camera. so it's taken me the better part of the afternoon to edit and post. the good news is i'm just trying to decide what to get, but i will be getting a shiny new one soon! hopefully, this one will hold out and be nicer to me until the replacement arrives. anyway, back to the card--it was fun to use a variety of stamps for a completely different purpose than they were intended. this was a recent amuseaddicts challenge, but i was in dallas and then overbooked, so i never got to it. sparkler poms, a muse; cosmobella tiger fan, stamping bella; and sentiment, from piece of cake by papertrey ink--i was on a search for something else and this just jumped at me! 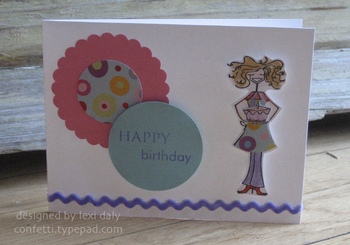 the note card is a muse; white card stock, papertrey ink; purple card stock, su! ; and there are touches of copic spica markers and yellow stickles for bling. a friend of mine found these little packs of summer charms for cheap on a shopping trip recently and thought of me--thanks michele! i was about to create with pmsabella, but there they were in front of me, so beachabella won out and this design just kind of took off. 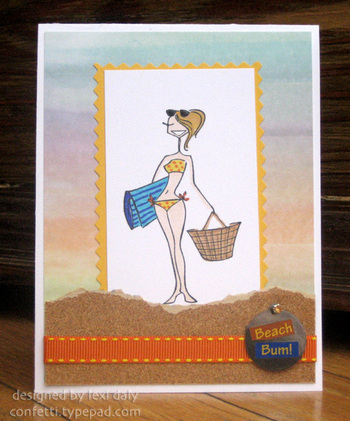 yellow, orange and blue from the charm became my main colors and there's nothing better than real sandpaper for a sandy beach card! my first idea for background paper was an orange one in my stash, but i found this one and thought it had nice touches of all three colors and reminded me of sunset at the beach. 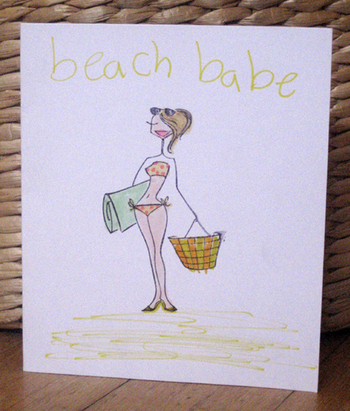 a happy beach card for a grey rainy day. maybe i'll get to pmsabella tomorrow! Your Dream Last Night: ??? ok, so one word didn't work so well for all of them. i don't know who to tag, so if you want to play, please do & leave me a link so i can read all about you too. 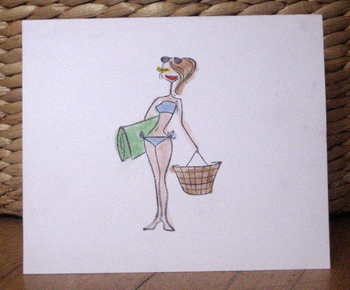 in honor of the pool opening this weekend and hanging out there this afternoon, i decided to create with beachabella. 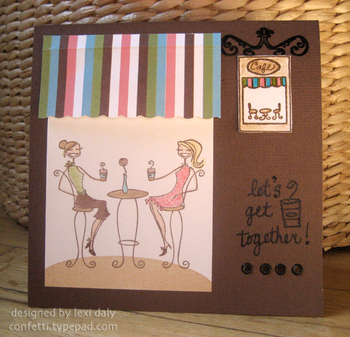 this was total freestyle stamping--i stamped and colored her first and then went in search of paper, embellishments, etc. totally different from what i've been stamping lately, but i do like the colors and it's fun to do different. one thing that remains the same--the glitter pen is well represented on bella's hair, suit and the flower centers, but you'll have to trust me on that! so here's to summer and many days of pool side fun... just a few busy half days of school to go! p.s. there's plenty of glitz on the car, but again, hard to capture in pictures. 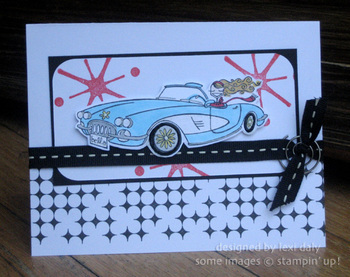 the atomic explosion is by hot potatoes, the retro pattern and spiral hardware by su!, the ribbon from michael's--and of course, cruisabella by stamping bella! sometimes when i see an image, i immediately think of another image in my collection. that's what happened when javabellas arrived. the a*muse cafe, an actual cafe when paired with the a*muse shopper girl below, suddenly became a hanging sign in my mind when i saw the size of javabellas. it's taken me a while to get around to figuring the actual design and layout, but i finally worked on it this weekend while bella stamping with the girls. after two days of fiddling and then having to adjust my poorly centered hand written sentiment by adding the cup, i think it's pretty close to what i imagined! ETA: if you haven't already, don't forget to check out the mother's day inspiration gallery at a*muse news and vote for your favorite card--voting ends tonight at midnight (pacific time)! 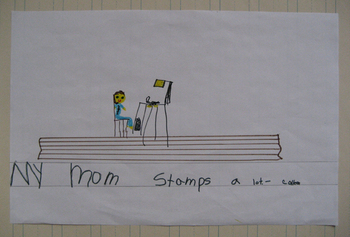 my mom stamps a lot! 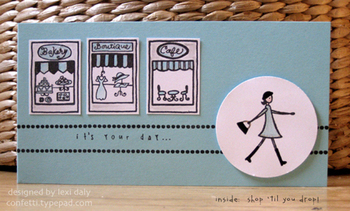 and today i stamped the day away!